In 1991 letter to shareholders, Buffett explained his thought process in valuing a business. Given below is the excerpt from the letter. If we translate Buffett’s writings into a mathematical equation, we would get an equation as shown below. This equation is called as Gordon Growth Model. It is named after Myron J. Gordon who originally published it in 1956. His work borrowed heavily from the writings of John Burr Williams 1938 book The Theory of Investment Value. I was using this equation for a very long time without understanding how it was derived. This is akin to learning about swimming by reading a book without getting into the water. I decided to learn how Gordon arrived at this equation. And it is the subject of this post. Before venturing into the proof, I wanted to make sure that Gordon’s method produced the same result as the traditional DCF valuation model. The calculation assumes that the growth rate is 6% and the discount rate is 10%. From the calculations given below we can clearly see that the intrinsic business value for the DCF model converges to the value of $25 million produced by Gordon’s method. Spend sometime to make sure that you really understand the calculations. The next step is to prove that Gordon’s method is going to work for every possible values of discount rate and growth rate. Let E be the owners earnings, D be the discount rate, and G be the growth rate. So we need to prove what is shown in the image. At this point, I have no idea how to proceed with this proof. What should we do? Let’s ask George Polya, the Hungarian Mathematician, who wrote the fantastic book How to solve it. What would he say? Look at the unknown! And try to think of a familiar problem having the same or a similar unknown. Just a simple cue from Polya helped me to come up with a similar problem; summation of infinite geometric series. 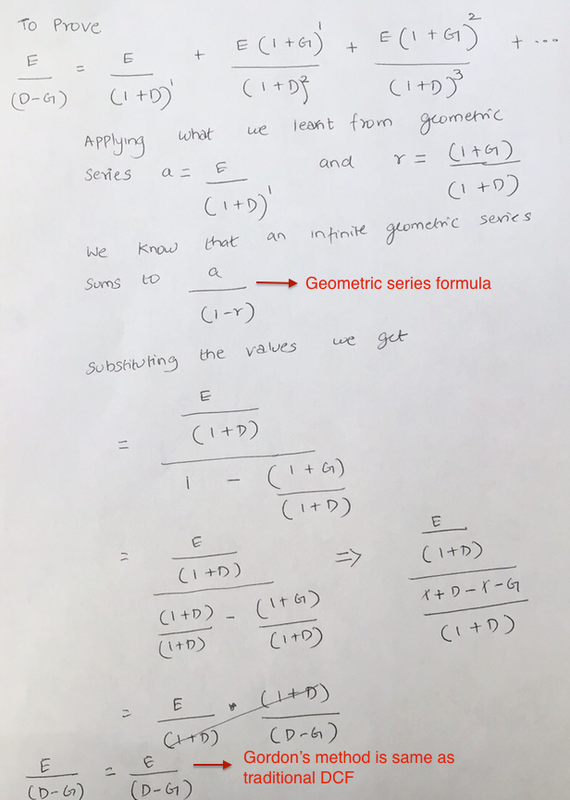 In mathematics, a geometric series is a series with a constant ratio between successive terms. 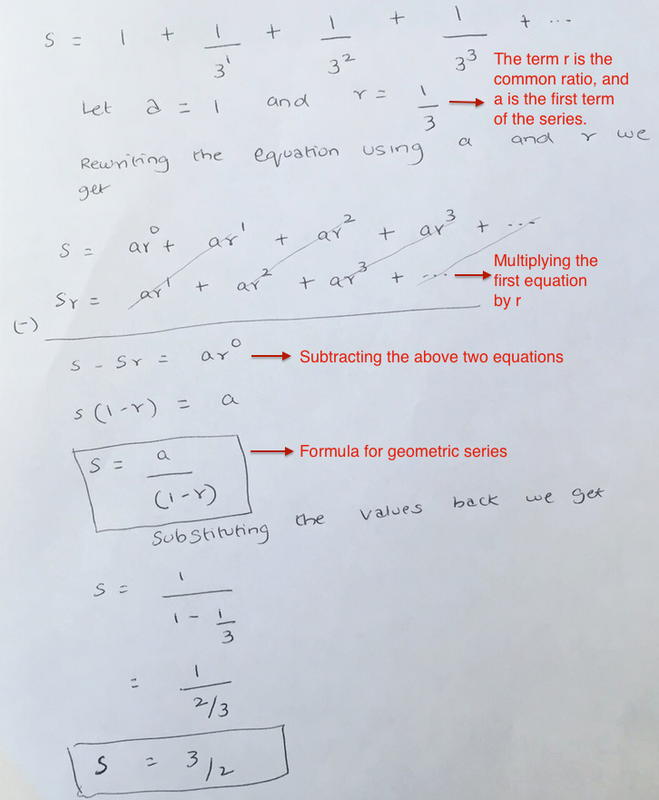 Using a simple example, I have explained how to solve a geometric series. Using the geometric series formula derived above I proved that Gordon’s method is same as traditional DCF model. The proof given below is very easy to understand. Upon closer inspection we can see that Gordon’s growth model is used in calculating the terminal value of DCF. Also Penmann uses the same formula for figuring out the intrinsic value. Gordon’s model breaks down when growth (G) is equal to or greater than the discount rate (D). Will this happen? Yes it does for businesses with durable competitive advantage; moats. And moat enables businesses to grow their owners earnings above the discount rate for a long time. The period in which owners earnings grow abnormally is called as competitive advantage period. In the example given below, the owners earnings is expected to grow at 20% for the first 7 years due to moat and thereafter it mean reverts to 3% due to competition. In that case the business at 10% discount rate will be worth around $43 million after 7 years. If the business is selling today for $15 million then your expected return after 7 years will be around 16.25%. Thus by splitting the calculations in two parts we have addressed the limitations of Gordon growth model. This should also explain why DCF has two pieces of calculations. Few weeks back Prof Bakshi wrote an excellent post on valuation which can be found here. The excerpt from the post caught my attention. I wanted to know if he uses Gordon’s growth model. And the answer is yes. In his calculations he uses exit multiple which is nothing but an inverse of earnings yield. If his discount rate is 10% then at 10x multiple his G will be zero. At 15x multiple his G will be around 3.4%. And at 20x multiple his G will be around 5%. The table given below shows the relationship between exit multiple and growth rates. Wonderful. Do look at Aswath Damodaraon”s Valuation slides. Has derivations for all these. Jana, really nice post. I have a question about the discount rate. why should it be 10%. can i assume it to be higher. By discount rate you mean the required rate of return right. what if i needed 15%. looking at sensex return for 10 years being 15% cagr. Discount rate and expected returns are different. In India fixed deposit rate (risk free) rate is 8%. So I used the discount rate as 10% which is my opportunity cost of not parking the money in a safe source like fixed deposit. On the other hand expected return is what I might get if I hold the stock for 7 to 10 years. In the example the expected return comes to 16.25%. G mean terminal growth rate right. 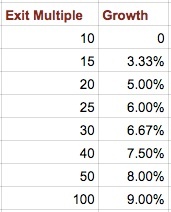 If assumed G is 5% , it means company will grow at 5% every year for ever. What did u mean by residual operating earnings in the kitex post . you have used the same E /(D-G). Is G here and there same? I explained the concept of residual operating earning here. In Kitex case, I used residual operating earnings to show what does the market expect at the current price. Then I used expected returns to show what will an investor get holding the stock for a decade. Thank you for the nice post. Please excuse my newbie questions. I have just started learning fundamental analysis. If DCF method = Gordon model = Bakshi Sir model then can we use either of them to achieve the same result ? If different; then I would humbly request you to please give an example(of any scrip) to see the difference in valuations by all three methods. Sorry for asking too much but just trying to learn and understand. I have explained these differences in this post. In future I will write a post showing examples of real companies and how I value them. At the end of the post there is exit multiple and growth rate table. I didn’t understand how you derive it. Assume a stock earning $1 and selling for $10. Your earnings yield is 10% ($1 / $10) and the earnings multiple is 10 ($1 * 10). Yield and multiple are inverse to each other. Now let’s keep the discount rate at 10%. If I expect the earnings to grow at 4% then the yield will be 6% (10 – 4%). And the multiple will be 16.67 (1 / 6). In accounting for value 1 when you assumed the growth rate to be 5%, the free cash flow at the end of 2019 was multiplied by 5% and continuing value beyond 2019 was calculated by Free Cash Flow *1.05/ (rate of return- growth rate). Now in this post we are assuming owner’s earning will continue to grow forever by 3% should not the value of 2.99 be multiplied by growth rate of 3% and then discounted. Yes you can keep higher discount rates. For me I tend to keep it slightly above the prevailing fixed deposit rates. And make sure the quality of the business is very good. Can Gordons Formula also be understood wrt dividend payout ratio for a Zero Growth, or only Growth with Zero Dividend payout. Dividends are given out of earnings. So Gordon’s growth model can be used for companies that payout dividends. Earnings retained by the company are reinvested back in the business and it generates more earnings. Whereas dividends are invested by the investor. And you need to take care of that. In the link given below take a look at Business B in the excel sheet – Five Companies. Wanted to know about your qualification and present employment if that’s not a problem. I am a software engineer by profession. Last few months I have taken a break from work to focus more on reading and writing. I never went to college (circumstances forced me to take up a government job at 18) and did Bachelors in Mathematics and Master in computer application through distance education. WOW… Respect!- my dear friend. Respect! my personal respect towards you has gone up notches higher after reading what you’ve just written about your educational background. from the distance that i am at, I see you as a rare combination of humility, simplicity & knowledge! you may choose to or not choose to publish this comment of mine but i’d like to see/read/hear an article or even a reply about something like “why I took a break from work to focus on reading/writing”. Sounds like you have reached some tipping point and want to build more momentum through learning. I’d be happy to learn about learning from someone like you. Thank you for the comments. Towards the end of this year (after 1 year of break) I might write about it. Good one. The last table can be used not only for exit multiples, but can be handy in inverting & look at current PE multiples & see what growth rates markets expect from this business. In that case, I have effectively invested in a bond & kept the growth-upsides for myself. Agreed. Growth should be icing on the cake. Why would anyone invest into a company which is growing at a rate lower than the discount rate? Probably only if they are available at much lower price compared to this value. If we now compare these theoretical numbers with the companies trading on stock markets, most of them seem cheap (PE lower than theoretical numbers as above). Are they really cheap? I tend to believe not as so many companies cannot trade at such lower PE values for so many years. Do you think that we may have to include margin of safety into these calculations? If this argument makes sense, how can one determine the right margin of safety? How can one determine that the market has not already accounted for all this and incorporated an appropriate safety margin into the price? Only handful of companies can grow its earnings faster than discount rates for a very long periods of time. As an investor one should not predict this is going to happen and pay a very high price as future is unpredictable. Prof. Bakshi already wrote about this and you should be able to find the answers to your question. As I reflect on these posts by Prof. Bakshi again in light of your post, I am now able to get more clarity. Thanks for pointing me to these links. Just a small question. When you derive the value of 42.66 mn, the formula you have used is 1.99/(0.1-0.03). Instead as per the Gordon growth formula, the formula should be (1.99*1.03)/(0.01-0.03), right? I think the Gordon formula uses the cash flow of one year later than the time when you are valuing the business, and hence we need to factor in the growth rate of 3% in the numerator while calculating the terminal value. That way the value comes to around 44 mn. Sorry, a correction. It should be (1.99*1.03)/(0.1-0.03). You’re right. It should be (2.99 * 1.03) / (0.1 – 0.03).